Apple CEO Tim Cook has gone viral in China with a pledge to protect one million acres of forest. 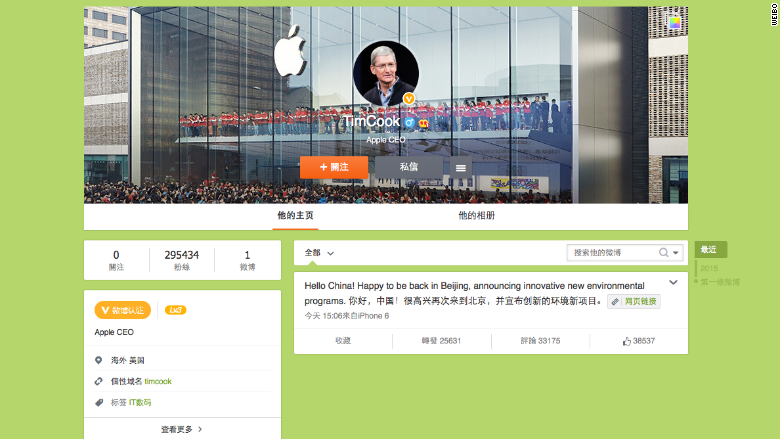 Cook published his first post on Weibo -- China's version of Twitter (TWTR) -- on Monday, using his iPhone 6. "Hello China! Happy to be back in Beijing, announcing innovative new environmental programs," he wrote in English and Chinese. Just three hours later, @TimCook had 301,628 followers, and the numbers were continuing to climb rapidly. Cook isn't yet following others on Weibo, and hasn't posted anything else. His first post received 62,000 likes and has been reposted more than 37,000 times. The debut post refers to Apple (AAPL)'s announcement that it's working with the World Wildlife Fund to protect as much as one million acres of forest in China. The forests provide fiber for pulp, paper and wood products. The move is part of an initiative by the company to have zero impact on the world's trees, and to power all of its operations using only renewable energy. "Forests, like energy, can be renewable resources," said Lisa Jackson, the former head of the U.S. Environmental Protection Agency and Apple's vice president of Environmental Initiatives. "We believe we can run on naturally renewable resources and ensure that we protect—and create—as much sustainable working forest as needed to produce the virgin paper in our product packaging." Related: Did China's smartphone market just shrink? Apple's announcement comes just three weeks after the company unveiled its first major solar project in China. The company said that 87% of its global operations run on renewable energy, and the Sichuan Province solar project will bring Apple even closer to its commitment to reach 100%. "This won't happen overnight. In fact it will take years. But it's important work that has to happen, and Apple is in a unique position to take the initiative toward this ambitious goal," said Cook. "It is a responsibility we accept." The solar installations in Sichuan, a partnership with SunPower Corp (SPWR) and a handful of Chinese companies, should generate enough energy to power 61,000 homes. 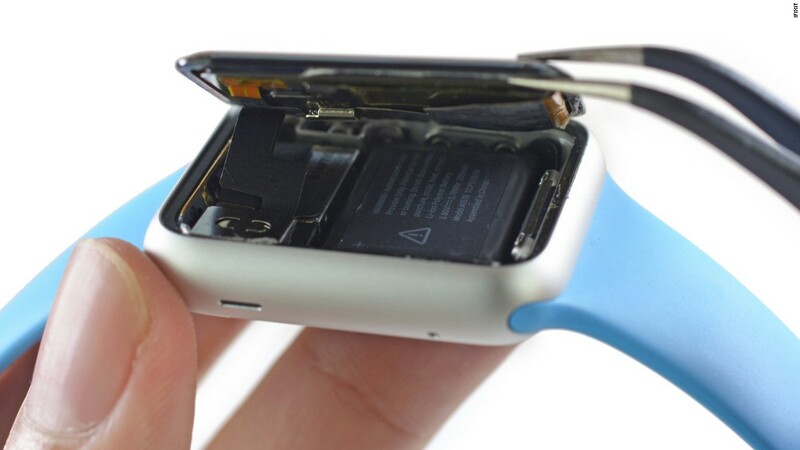 That would be more than enough to supply all Apple's offices and stores in China.